Weddings at The Glen Hotel can be held in a silk lined marquee that overlooks our garden ceremony courtyard with the beautiful Glen Lake as your backdrop. Have your ceremony in our garden courtyard, wander 30 meters to the waters edge for your photos, and then 50 meters to your silk lined marquee reception – everything you need in one convenient location. For a smaller affair we have our newly refurbished The Elaine Room. A room that reflects elegance and class, The Elaine Room is perfect for an intimate reception. Close to our garden courtyard you can also choose to have your ceremony, photos and reception in one convenient location. We also offer special packages from Monday to Thursday. You only get one shot at the perfect wedding and with 23 Years experience you can rely on Annie, our Functions Manager to make it an everlasting memory. Our silk lined Marquee is the perfect option for couples looking to impress. This unique & stunning Silk Lined Marquee is our largest function space. The venue overlooks the garden ceremony courtyard with the beautiful Glen Lake as a backdrop. For a smaller affair we have our newly refurbished The Elaine Room. A room that reflects elegance and class, The Elaine Room is perfect for an intimate reception. For the marquee, add $6 per person with a minimum of 80 guests. 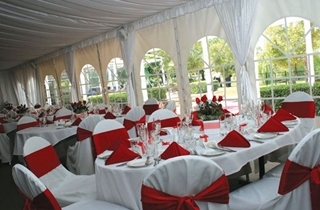 For the marquee add $6 per person with a minimum of 80 guests. Limousine transfer for the bride and groom to the Brisbane Riverview Hotel in Hamilton with buffet breakfast for two and late check-out. 3 course set menu (alternate drop) and canapes to start, plus 5 hour beverage package. Includes: Fresh flowers for your guests' tables Limousine transfer for the bride and groom to the Brisbane Riverview Hotel in Hamilton with buffet breakfast for two and late check-out. Deluxe buffet package with 5 hour beverage package.